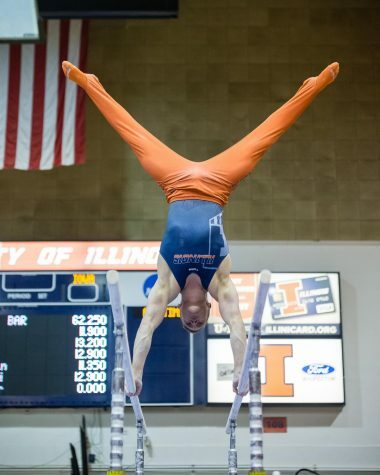 Alex Diab performs on the still rings during the meet against Iowa at Huff Hall on Jan. 26. Diab has accumulated 41 total event titles. The Illinois men’s gymnastics senior class has already left a legacy on the program. The seniors have won a Big Ten Championship, multiple individual National Championships and have even been named All-Americans. 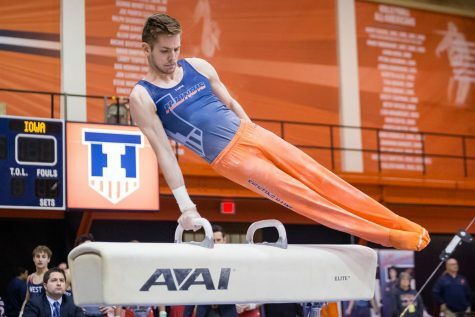 The Illini are led by three seniors, Alex Diab, Johnny Jacobson and Ross Thompson. Diab has had a storied college career, winning four Big Ten event titles and a national championship. 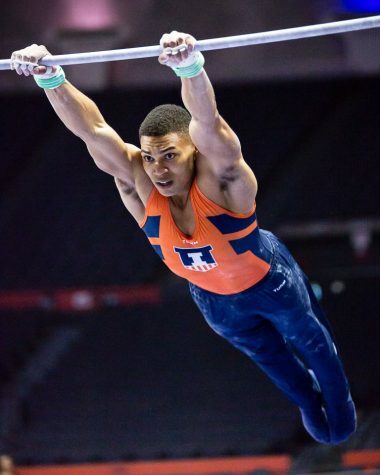 Diab has also set the Illinois record with 28 still rings titles and has accumulated 41 total event titles. 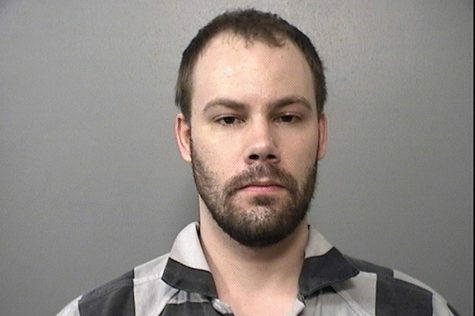 With Diab’s career coming to an end, these last few weeks have been bittersweet. “I have been enjoying it, but I’m a little sad it’s going to be over soon,” Diab said. Jacobson has also had a very impressive college career. Jacobson is a two-time All-American, a Big Ten champion and an Academic All-Big Ten. 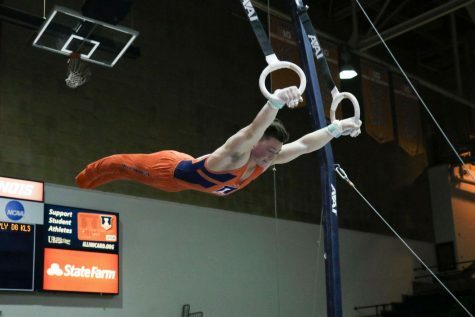 He’s been especially good on the parallel bars, racking up eight event titles; however, he’s been a standout in his all-around routine and has six event titles. Diab and Jacobson are leaders on the mat, but they have found a way of bringing the team together through some friendly competition. 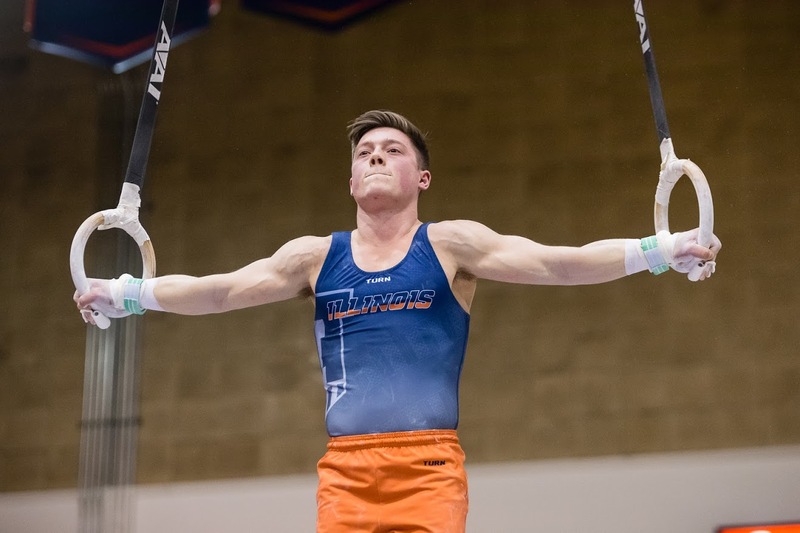 In spite of the fact Thompson isn’t the gymnast of Jacobson or Diab’s caliber, his value to the team is immense. Thompson is always leading the team in stretching, cheering on the team at events and, simply put, is a vocal leader. 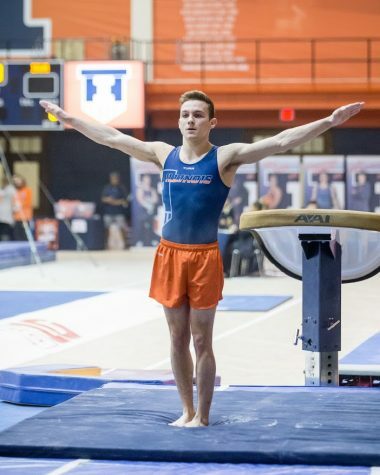 His presence was exemplified during the Illini’s senior night. 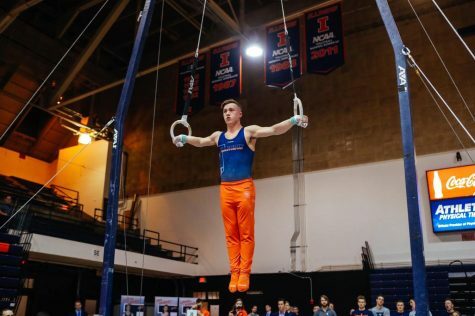 After competing in his final meet at Huff Hall, Thompson refereed the Illini’s very own American Ninja Warrior competition. He stayed engaged with the team and community for the sake of chemistry and team morale. For Thompson, this group of seniors is special. 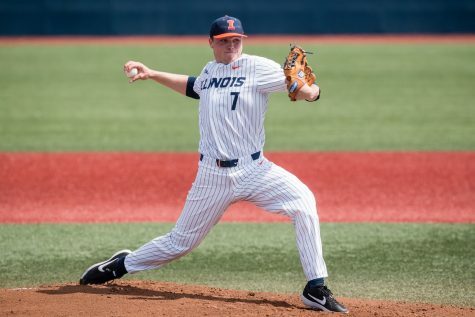 With the Illini’s season winding down, this has become a time for reflection. The seniors will be moving on soon, and head coach Justin Spring couldn’t be happier with the group. These seniors have one more week as NCAA athletes, and it will be the biggest week of their athletic careers. 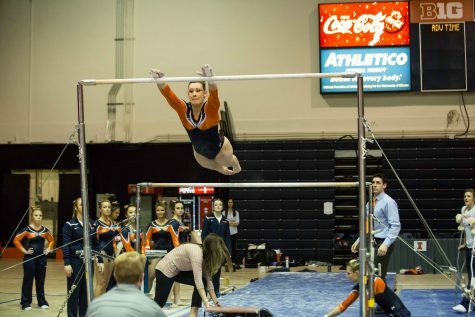 The Illini will compete in NCAA qualifiers on Friday and Saturday and then will likely compete in NCAA finals. 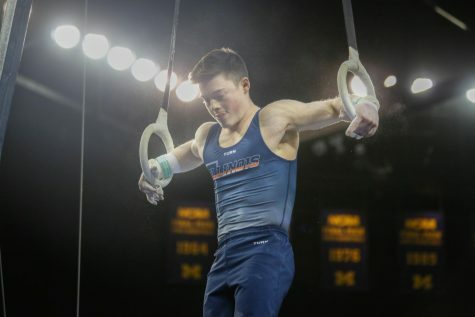 Both qualifiers and the championship rounds will be held at the State Farm Center, so the seniors will have one last chance to compete in front of their home crowd.